The next service will be on Thursday 25 April 2019 at 7 pm. 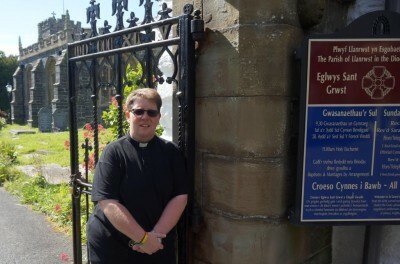 The LGBTQIA+ chaplaincy is led by the Revd Sarah Hildreth-Osborn, who is the Vicar based at St Grwst Church, Llanrwst. The chaplaincy will be a safe sacred space where LGBTQIA+ people can gather to explore their spirituality and be affirmed as created in the image of God. It will be rooted in the belief that all are welcome and focus on pastoral care. There will be a Eucharist specifically for the LGBTQIA+ community at least once a month, known as an Open Table. The chaplaincy will be holistic in its approach: after each service there will be an opportunity for fellowship, to share stories and learn from each other’s journey of faith. The service is open to everyone. Clergy colleagues will be able to refer people to Sarah, especially those seeking information about marriage and blessings. At the moment it’s just Sarah as chaplain but there are plenty of other supportive clergy and lay people across the Diocese. Sarah says, 'in these early stages, I think it’s important that those leading services are themselves members of the LGBTQIA+ community. "All One In Christ" is a short film made by members of Changing Attitude Trawsnewid Agwedd Cymru through the Iris Prize Outreach scheme. It won first in the community films section of the Iris Prize. The film was part of a mini Iris Prize film festival called Telling Our Stories, featuring people’s stories from across the world. It was made in response to an invitation from the bishops for church groups to get involved with the Iris Prize Outreach scheme. Iris also gave a special leadership award for the group's work within church and society for LGBT+ inclusion.